In 1995 the Canadian government, under the control of the Liberal Party, passed the Firearms Act, which established a registry and licensing program for long-gun owners, as well as storage and transport requirements. 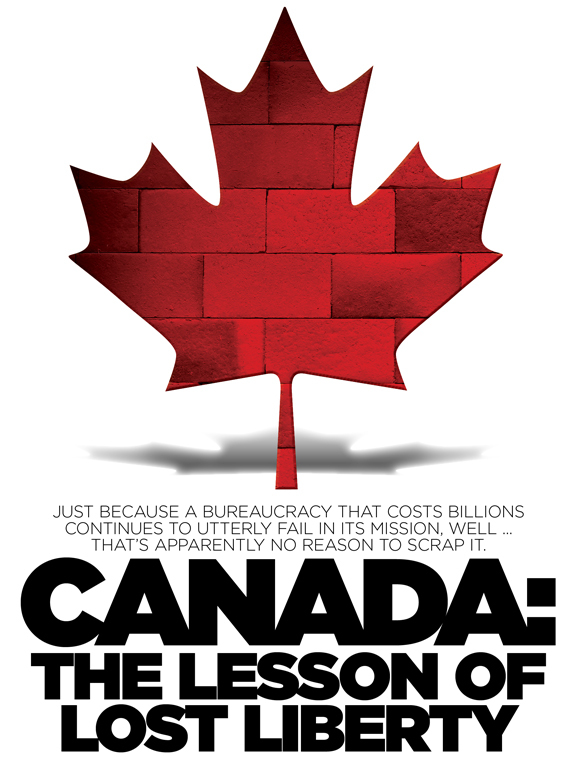 Pitched at the time as a crime-reducing, life-saving tool that would cost just a few million dollars over several years, the registry—which took effect in 1998—soon ballooned into a money pit that government estimates suggest has cost upward of 2 to 3 billion dollars Canadian. All while having no effect on violent crime rates. When it became clear that the registry had done nothing to lower violent crime, it just infringed on the rights of law-abiding gun owners, supporters of the registry walked back their prior claims, stating the registration and licensing scheme was in fact an attempt to reduce "gun deaths," not an attempt to bolster public safety overall. The resulting boondoggle has garnered the ire of a majority of Canadians, not just law-abiding gun owners. The time seemed opportune this past September for the registry to be scrapped. Canadian Prime Minister Stephen Harper`s minority Conservative Party vowed to overturn the registry, but even though it`s been an unmitigated failure, his party`s efforts fell one vote shy. As you`ll see, Canadian culture is much less dedicated to personal freedoms than its American counterpart, but don`t think for a moment that the licensing and registration scheme to which Canadian long-gun owners are subjected hasn`t been tried, and won`t again be attempted, in the United States. That such an egregious affront to freedom, and sound economics has engendered such a protracted battle—and has yet to be overturned—speaks volumes about the difficulty to regain rights once they`re lost. That is why American gun owners must remain watchful of such schemes that would denude our Second Amendment—whether at the local, state or national level—by politicians, bureaucrats, anti-gun groups or international agents promising violence-free utopias for the price of a few precious freedoms. Though the United States and Canada share similar histories as New World siblings shorn from the British crown, the core differences in how personal freedom is viewed in each country have resulted in disparate policies. While the protection of the Right to Keep and Bear Arms is explicit in the Constitution of the United States, Canadians have long been blasé about gun rights and other personal freedoms, resulting in the establishment of Canada`s billion-dollar boondoggle of a registry, says Gary Mauser, professor emeritus of the Faculty of Business Administration and the Institute for Urban Canadian Research Studies at Simon Fraser University in Burnaby, British Columbia. "It`s very interesting, we`re very similar, there`s probably no pair of countries that are more similar, but there are differences—important ones," Mauser said. He should know, he holds dual United States and Canadian citizenship. "Both Canada and the U.S. were founded by English idealists," Mauser said. "In the United States after the Revolution there was a central concept that government should not be trusted. But in Canada the founders believed in a strong central government. For example, there are no checks and balances in Canadian government. "The second (major difference) is that in Canada, as in Europe, there`s a basic distrust of the people, and a faith that government will protect them," Mauser said. This distrust of the people, he said, is inherent not only in the government, but in the citizens. "An example would be after the American Revolution, many former Americans came to Canada, and those were the ones that supported the king, supported the government and preferred security over freedom—and that has colored much of Canadian history. We have similar immigrants from all kinds of sources, but Canada tends to get the more pro-government ones and the ones who distrust the people." The third difference between U.S. and Canadian culture that has produced much more stringent gun laws in the north, Mauser said, is that the Canadian government is much more centralized. "Imagine if the president (of the United States) was also the speaker of the House of Representatives, and he appointed everyone in the Senate. That would make it much more centralized, so it is easier to do radical stuff that may or may not be supported. " But while there are bedrock differences between U.S. and Canadian culture that have laid the foundation for European-style gun laws in Canada—namely a distrust of the individual and a wish for security over freedom—one can see some movement in U.S. politics trending toward these characteristics. In California, legislation that would start a long-gun registry was narrowly defeated in the state legislature. And truth be told, the platitudes offered by the Liberal government in the run-up to the Canadian registry are being mimicked today by anti-gun groups and politicians throughout the United States who promise solutions to violent crime through gun registration and licensing bills sold as "gun safety" programs—as though guns are the only means by which violence can be perpetrated, and outlawing guns will miraculously end social ills, law-abiding gun owners be damned. Since the establishment of the Canadian long-gun registry, Liberal mouthpieces have said the goal wasn`t to reduce crime, but a promise to reduce a nebulous thing called "gun deaths," Mauser pointed out. "That basic approach is really more citizen-control than crime-control," he said, "but neither goal has been achieved. Canada`s crime rates often parallel America`s, but while the U.S.`s continue to decline, (Canada`s) are coming back up again since the gun laws were passed. "We have a particularly unsurprising phenomenon—gang crime—which of course it has had no impact on. There may have been a reduction in gun use in suicide—that has fallen tremendously since the gun law has passed—but since there are many alternative ways to commit suicide—hanging, gas, a bunch of things—the suicide rate has not gone down commensurate with the reduction of gun suicides." If the registry`s true goal was to save lives, then the continued levels of suicide after implementation of the gun ban would find the Liberal party seeking other manners of reducing suicide rates, correct? Wrong. "They ignore that," Mauser said, "and that`s the usefulness of focusing on a thing like gun deaths, because many people think guns are the only possible powerful way to hurt somebody or yourself. It`s easy to forget that every house has ropes, most every house has cars and everybody has knives, so if you want to hurt yourself there`s lots of ways to do it." Mauser doubts the Liberal government truly believed the long-gun registry would save lives overall, and surely didn`t attempt to respect the rights of law-abiding Canadian gun owners. "Politics is about promises, not delivery, in any country," he said. "I don`t think the Liberals cared about the rights of gun owners—most gun owners then and now voted for other parties, so that`s not part of their constituency. And government costs are a two-sided coin. Only taxpayers care about limiting costs—governments having more costs means there`s more things to give away." And while the registry has had no positive effect on death rates, the cost overruns in implementing the system have been astronomical. "They said it would break even or, at worst, cost a couple million dollars, and Canada`s auditor general found by only looking at a part of (the registry) that it had cost at least a billion dollars, and if you add in the rest of it that she didn`t look at, it`s at least 2 or 3 billion," he said. In fact, the auditor general gave up even attempting to tally the true costs involved, due in part to government stonewalling. "It`s embarrassing," Mauser admitted. In fact, the Canadian Firearms Act, he said, has become a case example in business school for the incompetence of government. "Part of it is a programming problem," he said. "When they first introduced the idea, the people who introduced it didn`t know that different government departments define guns differently … that they couldn`t have one simple definition that fits all, so as they talked with more agencies they discovered more complexities and kept adding to the program until it just got to be too unwieldy. So part of it is just technical stupidity." Another problem with the registry has been in gaining the compliance of Canadian gun owners. So, Mauser said, the government has time and again had to extend amnesty periods in an attempt to get citizens to conform to the law. "Most of the immediately past Liberal governments, and now the Conservatives, have extended (the registry`s cut-off date) year to year so that if anyone—and I think the quote is `Anyone attempting to regularize their position`—so that if anyone is caught with an illegal gun, and they can make a plausible argument that they are trying to regularize and license and/or register [it], then they`re forgiven," he said. Still, gaining compliance has proven difficult—especially among Canada`s rural and native populations. As expected, public skepticism over the registry has also soared in Canada, Mauser said. "Almost everyone in Canada, polls show—but it depends on the wording—somewhere between 80 and 95 percent of the people believe it is a ridiculous expense and it doesn`t work," he said. "Even the supporters of it don`t think it works. They just want it anyway. "The police claimed it was very, very useful to them," Mauser said, as law enforcement could ostensibly check the registry before responding to a call. Of course, criminals don`t register their firearms, so this claim is questionable. "And the police, as any bureaucracy, don`t want to lose control of what levers they have," he said, "so they will continue their support for the registry, and that is a very formidable lobby group." This past September, when the minority Conservative government embarked on its effort to rescind the long-gun registry—but not the licensing requirements—it appeared several opposition party members would join the vote to scrap the boondoggle, but in the end gun owners came up one vote shy. "The only way the dumping of the gun registry could happen is if some opposition candidates or members of Parliament (mps) voted for the (minority Conservative) government motion. And two of the opposition parties forced their members to oppose the vote to dump it, but one party allowed its MPs to go on either side of the vote," Mauser said. "Six New Democratic Party (NDP) members turned their coats at the last minute, and had one of those not turned their coats, it would have passed." Yet Mauser maintains that the Canadian registry could still be overturned. "The Conservatives appear to be committed to dumping the long-gun registry, and they promised to bring it up for a vote in the future, but they asked the public to give them a majority," Mauser said. "So that means that a lot of people will be targeting the NDP mps who turned their coats, as well as Liberals who had voted for dumping the registry in earlier votes but backed out. So it all hinges on both politicians` promises and the next election." But, Mauser said, no one is certain when the next elections will be. "In a minority government it could fall at any time, so people think it will be next spring, but the election has been predicted now for the last two years." While the future of Canadian gun rights hangs in the balance, Americans can learn from the lesson of Canada: A right lost is nearly impossible to regain, even one sacrificed to a boondoggle of the proportions Canadian gun owners are dealing with now. Will Canada regain its lost rights? Mauser is optimistic, though wary. "I am hopeful that we can win back some—if not all—of the civil rights we have lost, but as shocking as it may seem, individual freedom is not held in as high regard in Canada as in the States," he said. "We`ve never had the freedoms Americans take for granted ... and government routinely likes to limit public powers, so it`s clear that it`s going to be a difficult fight." This is why American gun owners must learn from the mistakes of our neighbors to the north, and never sacrifice our freedoms for the specter of security. "It`s very interesting, we`re very similar, there`s probably no pair of countries that are more similar, but there are differences, important ones," Mauser said of Canada and the United States.